The more you browse the more you get confused because every person has a different requirements and different viewpoints. However choosing a conventional boiler over other will be the smart choice for you. Having a high efficiency conventional boiler is an ingenious space saving idea that has become an immensely popular choice in today’s household. To have installed the conventional boiler is perhaps a hefty investment. Naturally you don’t want to make a hasty decision. Therefore, it is imperative to buy the best boiler at the price you can afford. Conventional boilers are designed with 3 unit system within. 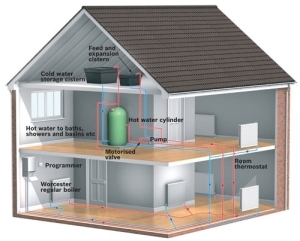 The product primary part is its boiler portion that has a function to heat the water. Another part is its cylinder tank that stores the heated water, and flows in the outlet to supply the hot water. Then there a no-complex control that provides you with quick hot water or you want to store some hot water within the tank. The features of the conventional water vary depending on the brand you choose. The bottom line is you are never without a hot water.Another added benefit of buying a conventional boiler is it has a huge capacity to store hot water, so incase of there is a shortage you can still have warm water to use. The maintenance expenditure is less and can be used in any property size as they are versatile designed. The actual benefit of the conventional boiler system is that you can simultaneously use in shower, run baths and taps in any bathroom. The boiler system is such built that it doesn’t affect bathing activity.There are ranges of conventional boilers available under different brand featuring with contemporary design and features. The best way to compare them is by taking the help of the Internet. It will let you to do the comparison amongst the prices, features and how it operates. Getting the insight of the conventional boiler you intend to buy will help you a lot about it.